Although mimosas are called an invasive “trash tree” by many, Dr. Seuss couldn’t have created a more delightful-looking flower than the mimosa bloom. Mimosa’s whimsical June blossoms bring happiness just to gaze upon them, and their bark, foliage and flowers can do the same when taken internally as a tea. 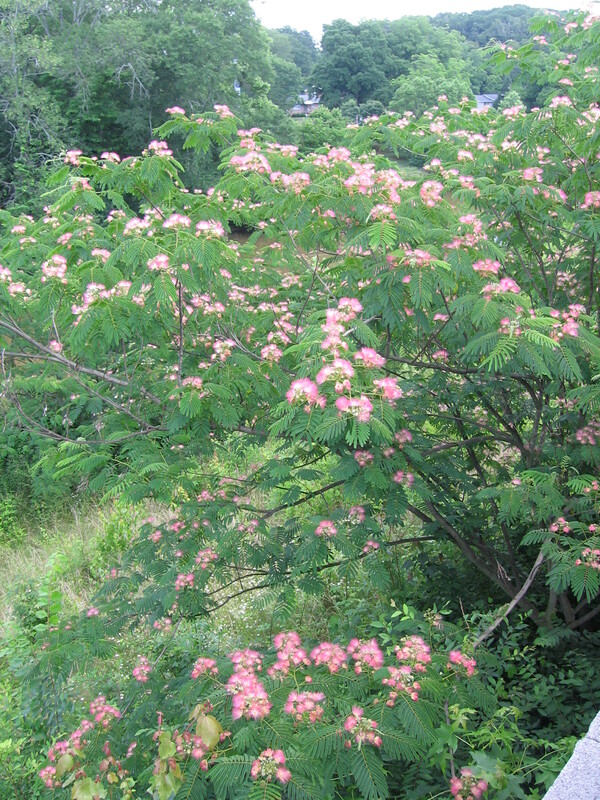 Mimosa trees, Albizia julibrissin, dot the roadsides with their pink blossoms in early summer giving a tropical appearance. The fern-like foliage is made of fine compound leaflets. 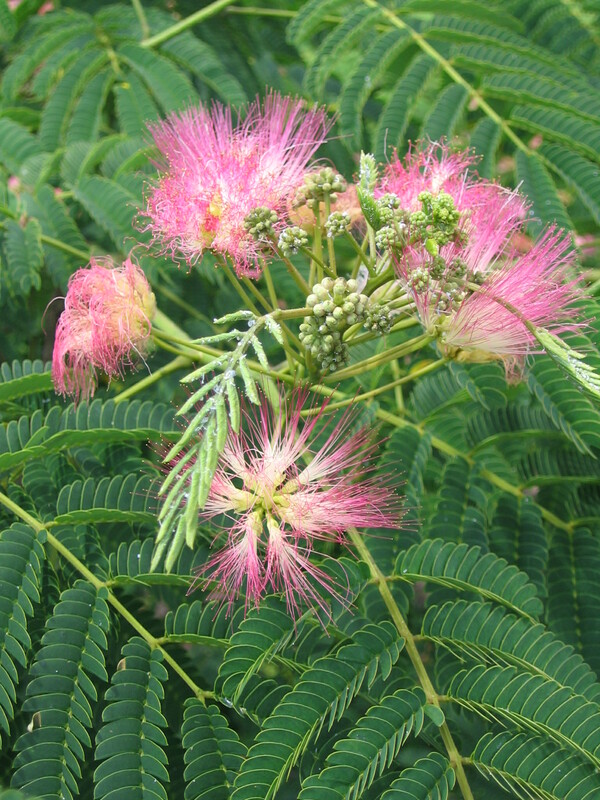 Mimosa flowers look like silky pink tuffs, giving the tree its other name, silk-tree. After the flowers fade, the seedpods form, resembling peapods, indicating it’s in the Fabaceae family, or pea family. Originally native to an area ranging from Iran to China, historical accounts suspect mimosas were introduced to America as early as 1745. The famous French botanist, Andre Michaux, introduced the mimosa tree to Charleston in 1786. They produce prolific seeds, which allowed it to quickly spread throughout the South. Mimosas grow where the soil has taken a beating. In fact, because they tolerate such poor soil and are capable of fixing nitrogen in the soil, they’re one of the species suitable for waste landfill remediation, synergistically enhancing the landscape. That’s an alternative meaning to “trash tree”. Mimosa blossoms, Albizia julibrissin, "Collective Happiness Flowers"
It might be pure coincidence, but I find it interesting that a tree which heals disturbed land can also heal a disturbed heart. In China the peeled, dried bark of mimosa, called “collective happiness bark” in Chinese, is used as an uplifting remedy for an irritable-type of depression accompanied by insomnia, poor memory, grief and anger. In Chinese medicine this type of depression is diagnosed as a shen disturbance, a shock or trauma to the spiritual aspect of someone’s heart. Current research has validated the traditional Chinese remedy of mimosa bark, showing that it relieves anxiety and has an antidepressant-like effect. Other studies have found that mimosa foliage and flowers contain antioxidants which inhibit the oxidation of the bad LDL cholesterol, decreasing the danger associated with high LDL cholesterol, which would make a lot of people happy. The bark is boiled and steeped in water. For a milder effect, one can also use the flowers and leaves. The tea should not be drunk during pregnancy or if one is taking prescribed antidepressants. Also, because mimosas grow in disturbed soil, do be careful not to use any part of a tree growing near railroad tracks which could have absorbed a considerable amount of toxins.